The Kabira Bay lookout point is a very touristy spot but a must-see place, even though it is prohibited to swim in this part of the bay (due to many tourist boats, strong current and mainly to protect the black pearls). The view is better in the afternoon due to sun’s reflection in the morning. It is also an excellent area for kayaking (required to launch your kayak away from the area where the tourist boats are docked). 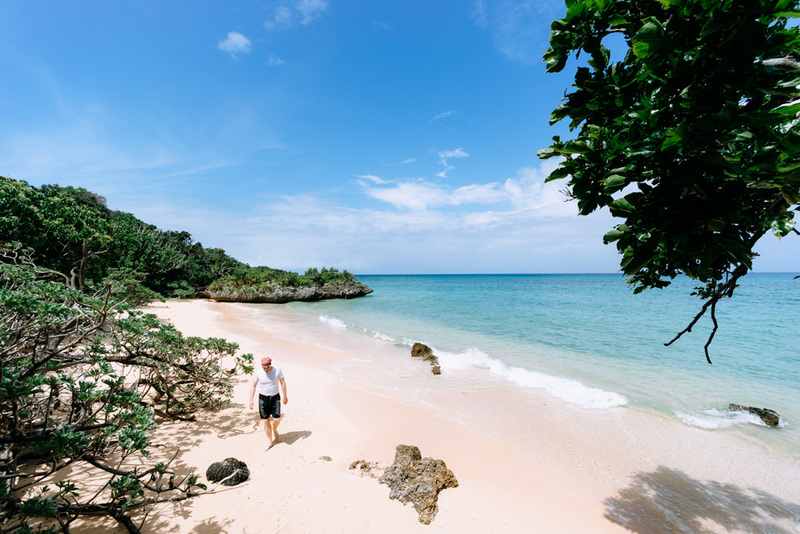 Not necessarily a good beach for snorkeling, but it is certainly one of the most visually stunning beaches on Ishigaki, with calm tropical water and plenty of shady spots under the trees. Due to the calmness of the water, it is a great place for SUP. 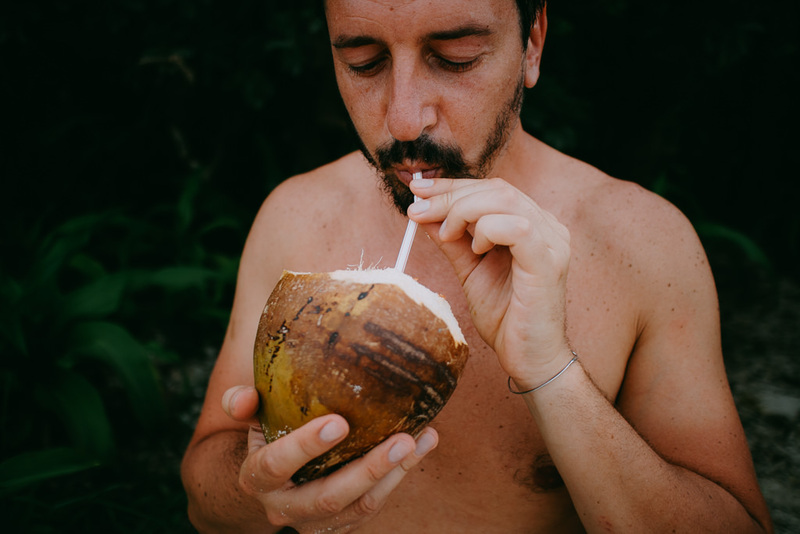 There are tasty wild coconuts growing on Kojima Island in the bay, which can quench your thirst if you are good at climbing trees. 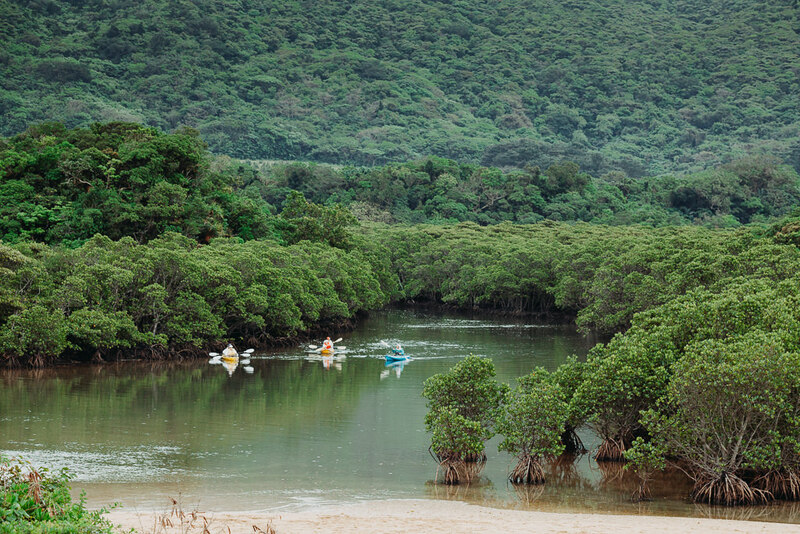 If you are not going to Iriomote Island but still want to experience the jungle by kayak, we’d recommend Fukidou River. 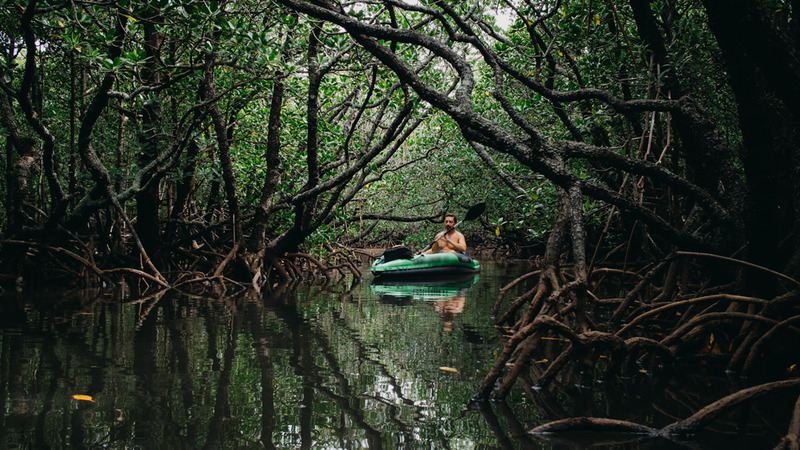 If you can’t bring your own packraft or inflatable kayak, the best tour is the “Mangrove kayaking & waterfall stream-hiking” (Half day tour, 5,000 yen) operated by Fukidou Kanko. The tour includes everything you need. The waterfall is also accessible on foot (see “Fukidou River” on our map for walking path). Note: Although malaria on the Yaeyama Islands was eliminated in the 1970’s, there are mosquitoes that carry Japanese Encephalitis (April-December), so best to use insect repellent just to be sure since most westerners don’t have the vaccination. Ishigaki boasts the world’s highest chance of encountering manta rays, about 90% chance while scuba diving at the point called Kabira Ishizaki Manta Scramble. There are also snorkeling tours to see manta rays but we must say that it’s often boring for snorkelers. The point does not have beautiful coral reefs and it’s too deep for snorkelers to enjoy (even if you can see manta rays, usually you see them very small from the surface). 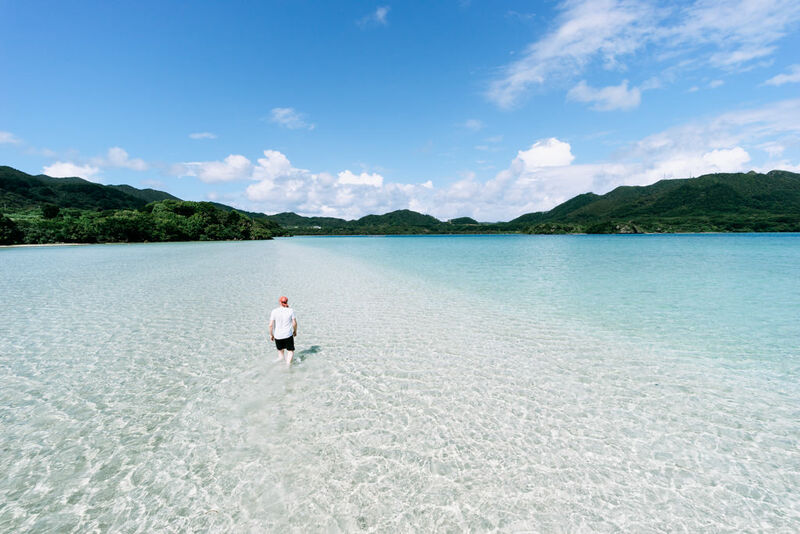 Ishigaki has more than 50 idyllic nameless small cove beaches, which are often deserted even during peak seasons. Some of them are easily accessible from the road side without having to use a kayak. Use Google Satellite and find your own secluded beach, keeping in mind the wind direction of the day. You can find some examples on our Ishigaki map. 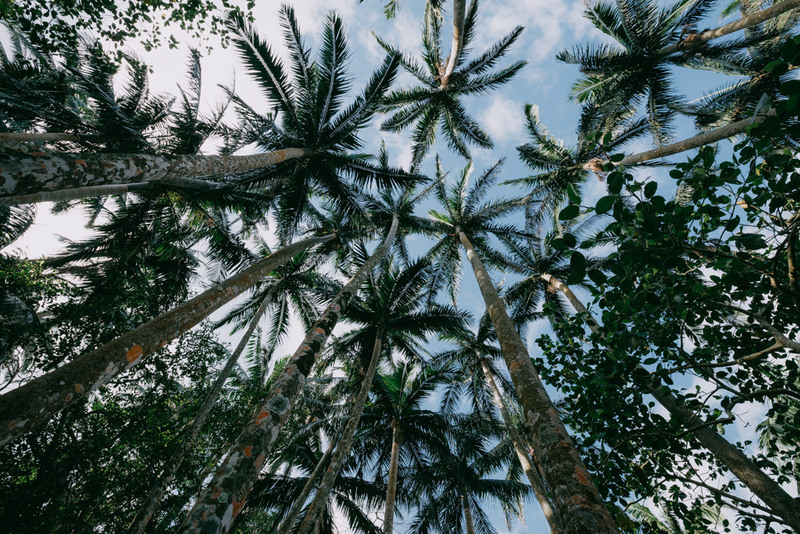 Yaeyama palm trees (Satake palm) are endemic to Iriomote Island and Ishigaki Island. They are very beautiful palms and they have been introduced to Hawaii and Southern Florida. The area is protected so you can only enter a small part of the area, but it is beautiful. There is a juice bar next to the parking area where you can enjoy various local tropical fruit juices. Seasonal fruits like pineapple, mango, guava, dragon fruit, passion fruit, star fruit, etc., are best between May and October. Sugarcane and banana are excellent all around the year. We also recommend the simplicity and total deliciousness of fresh sugarcane juice full of vitamins and minerals, not like unhealthy processed white sugar. Also as opposed to many other countries, sugarcane are pressed only one time for its juice in southern Japan, which gives more flavor rather than just sweetness. Also there is Satake Palm Memorial Museum within a 5 min walk from the juice bar. 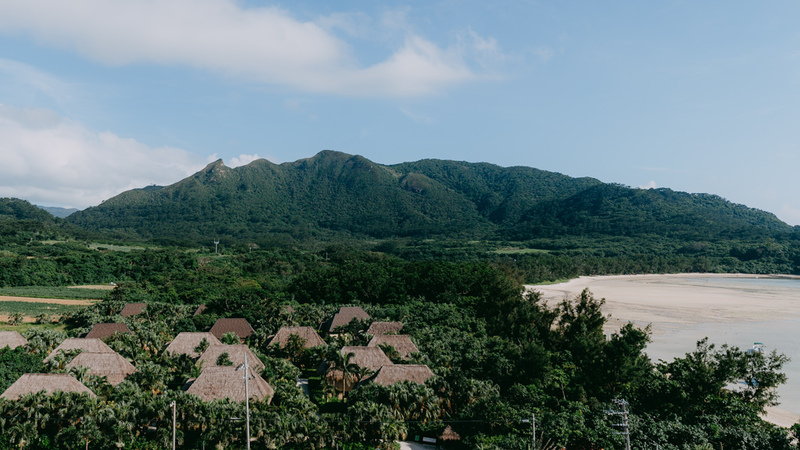 You can have a panoramic view of these Yaeyama palm trees and the outer reef of Yonehara from the rooftop of the museum. 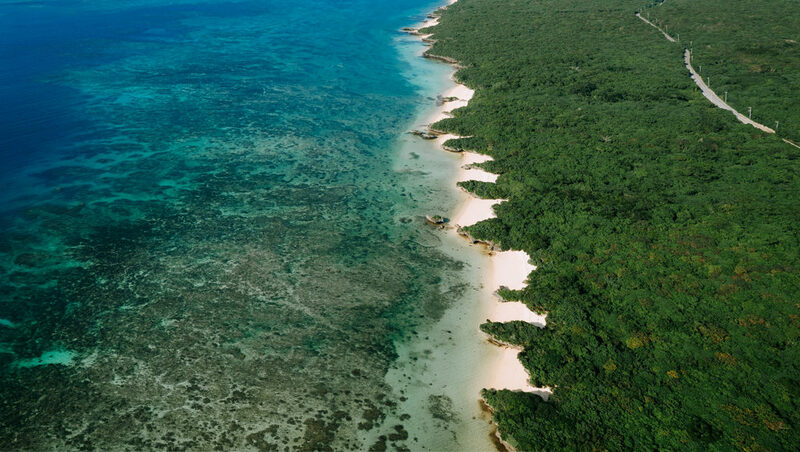 With any beach-entry snorkeling over fringing coral reefs, it’s important to snorkel around high tide in order to protect coral from breaking with fins, or stepping on coral accidentally. Also it can be dangerous as sharp coral can cut you. Please check Ishigaki’s tidal hours of the day here. 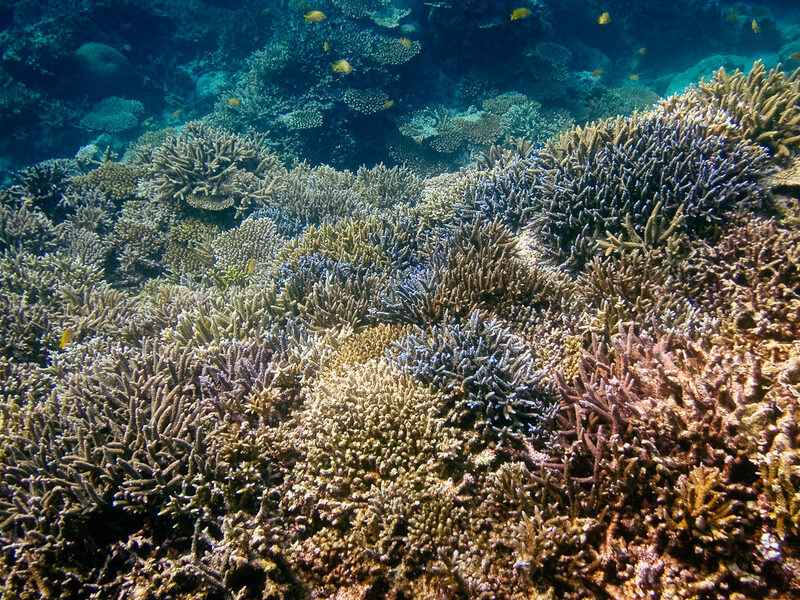 Shiraho Reef (along the south-east coast of Ishigaki Island) is internationally acknowledged as the world’s largest colony of Blue Coral. 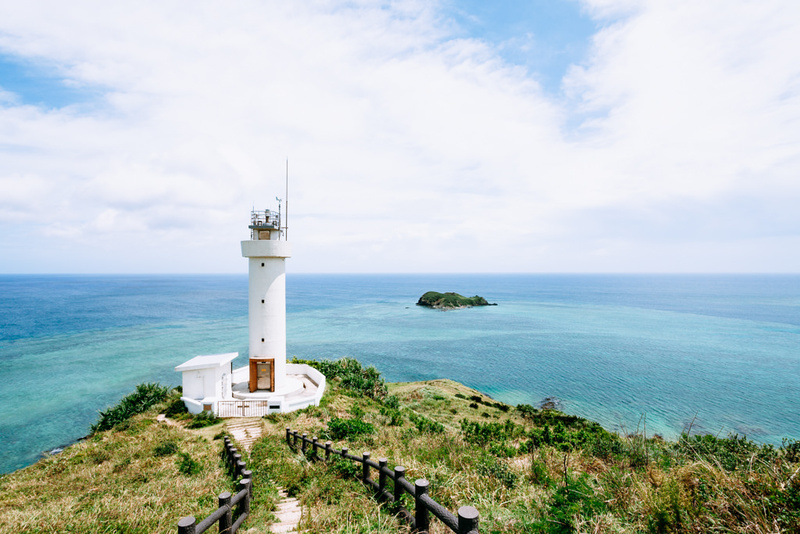 However, for easy beach-entry snorkeling, we recommend dipping into the water from Yonehara Beach, Akaishi Beach or this special snorkeling spot where you can see the colorful coral reef, many tropical fish, sea-snakes, etc. To see the amazing coral at the special spot, you have to swim about 10-15 mins from the beach to the reef edge. It’s close to the beach but you need to swim over a big drop (see the exact spot on our map). 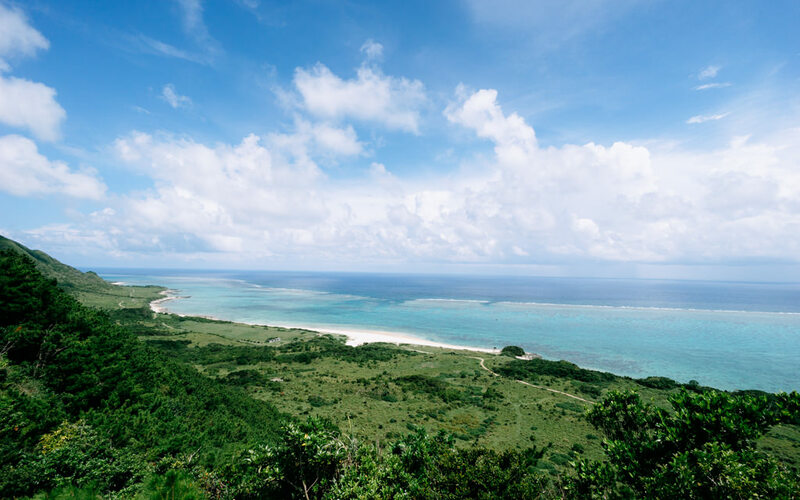 Yonehara Beach is famous for snorkeling so it attracts many tourists but snorkeling is actually not bad, with beautiful coral if you swim further to the reef edge. Akaishi Beach has beautiful Blue Coral just in front of the beach, often with no other people (see the exact spot on our map). The road to Akaishi Beach is blocked with a gate but the gate is just to keep the cows inside the grazing land so you can open the gate (just make sure to close it behind you!). In order to have good water clarity, it’s wise to choose the snorkeling spot according to the wind direction of the day. When it’s a north/west wind Akaishi Beach has good clarity, while in case of a south/east wind Yonehara or our secret snorkeling spot has good clarity. 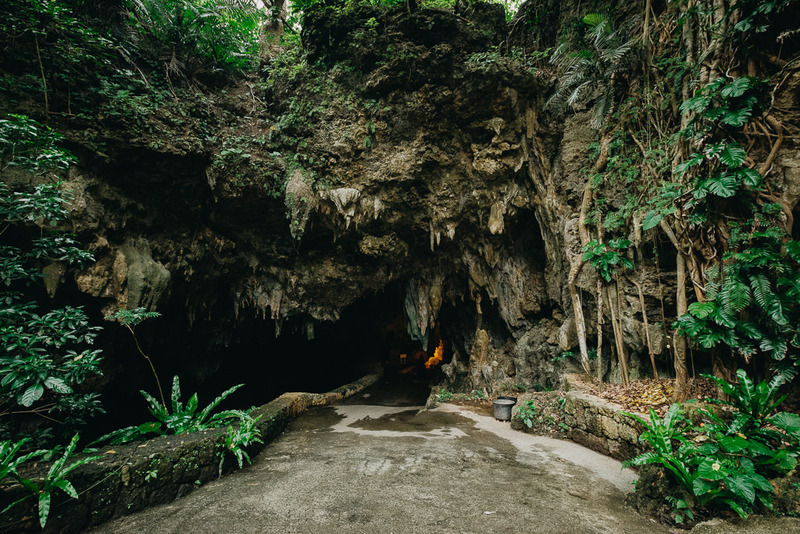 Particularly if it’s a rainy day or typhoon day, visit Ibaruma Sabichi Cave located in the north of Ishigaki. 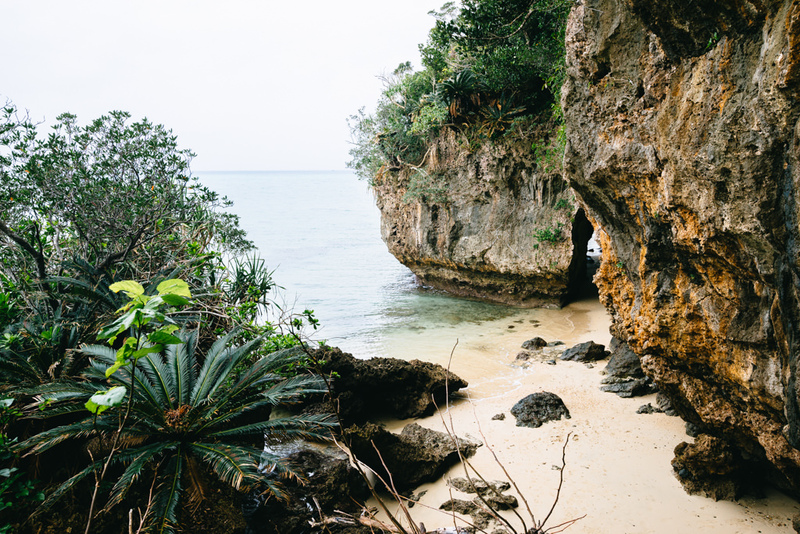 This cave is connected to some secluded beaches which are also nice to explore. There are several cave systems all over Ishigaki, however we thought this Ibaruma Sabichi Cave was much better than the LED-lit caves closer to the port. If you are not going to Iriomote Island but still want to experience the jungle by stream-trekking, we’d recommend the stream to the upper waterfall of Arakawa Falls. As you hike up this rugged stream, it becomes surrounded by beautiful tree ferns. There is a car park by the road. Check our map for the entry point as it’s different from the lower waterfall of Arakawa Falls, which is popular among local kids. This stream-trek takes about 30 mins to get to the upper waterfall. Stream-trekking shoes (felt soled shoes) are highly recommended since you need to go over slippery mossy boulders. 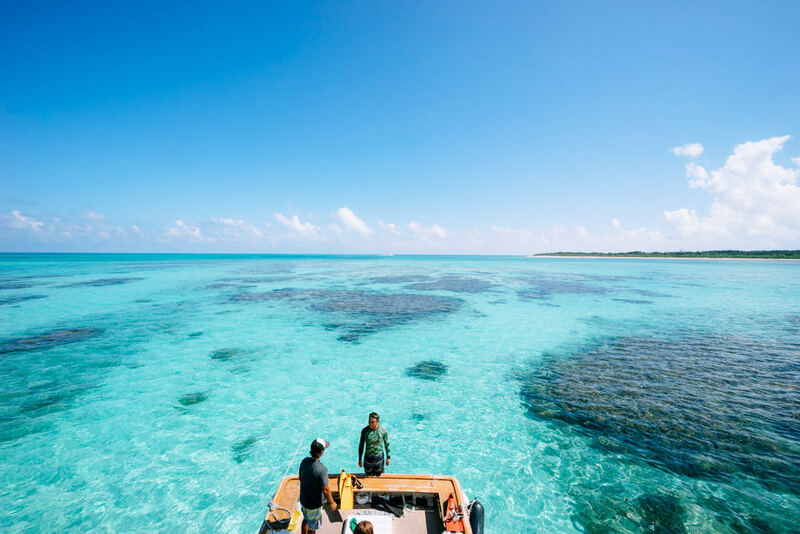 We highly recommend a half-day or whole day snorkeling tour to Sekisei Lagoon. It is sublimely beautiful. Ok, it’s not a “cafe” or “restaurant” but it is worth a mention to get the best juices on the island! 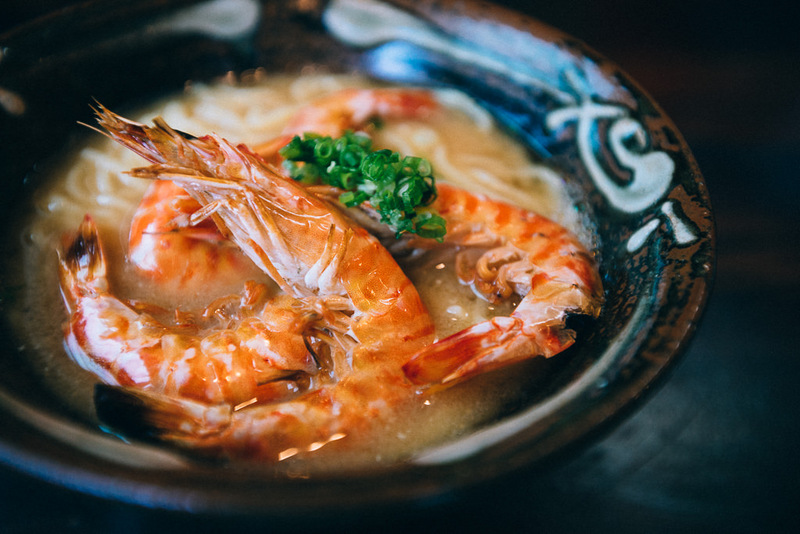 Delicious home-made soba restaurant, famous for their soba with “Ishigaki Kuruma Ebi” (Japanese tiger prawn from Ishigaki Island). 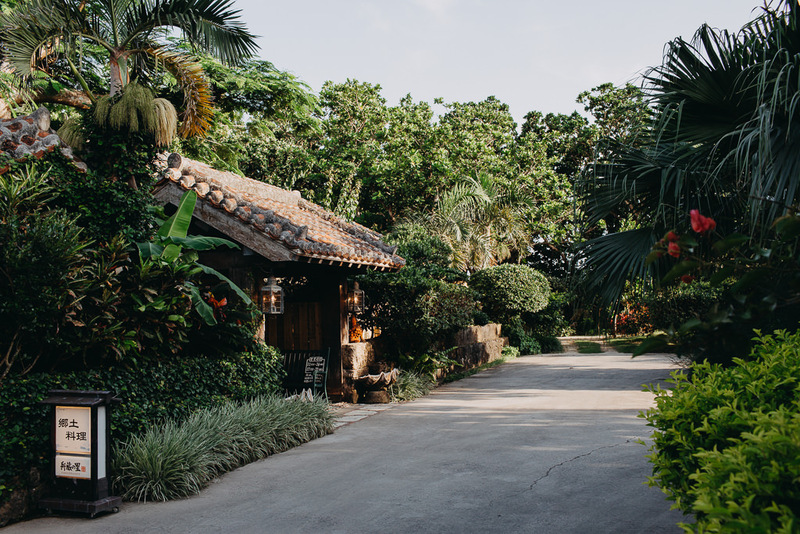 For all things local, namely fresh fruit and vegetable, check out the local farmers market “Yuratiku market”, located a few hundred meters from Ishigaki Port. Shiraho Sunday Market is located within the “WWF Japan Coral Reef Conservation and Research Center” at the coral village of Sangomura, about 25 minutes drive west of Ishigaki Port. Cheap seasonal fresh produce and traditional prepared food such as food wrapped in banana leaves. We love these road-side stalls – you never know what you’re going to find available! You can get very fresh vegetables and fruits directly from farmers for a very low price. Just drop the designated amount in the money jar and you’re set to go. It goes without saying that a car is essential on Ishigaki Island. You can rent a small car just for a few thousand yen per day including insurance (can be as little as JPY2,000 per day) through the Japanese version of Rakuten Travel. Unfortunately, the price is often double on most English booking websites (only costly international rental car companies are in the English system). Best to ask someone who can read Japanese to book, or use our service. You will need an International Drivers License. Ishigaki has started to have more and more nice and reasonable accommodation in beautiful locations recently. 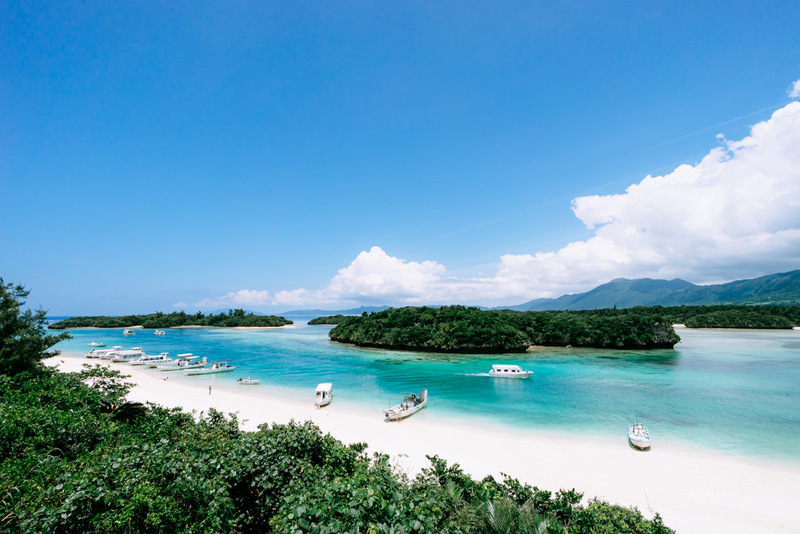 If you need help booking accommodation on Ishigaki, check out our service. 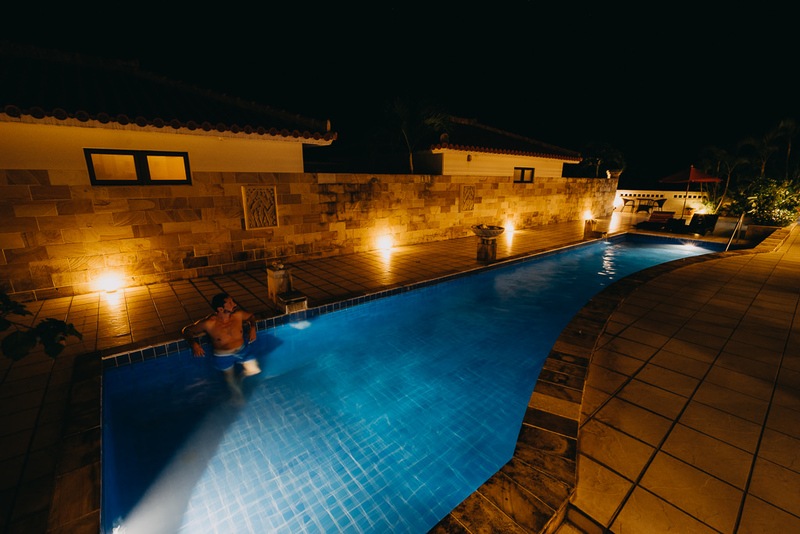 A lovely boutique hotel set beside a beach, with a beautiful central pool. 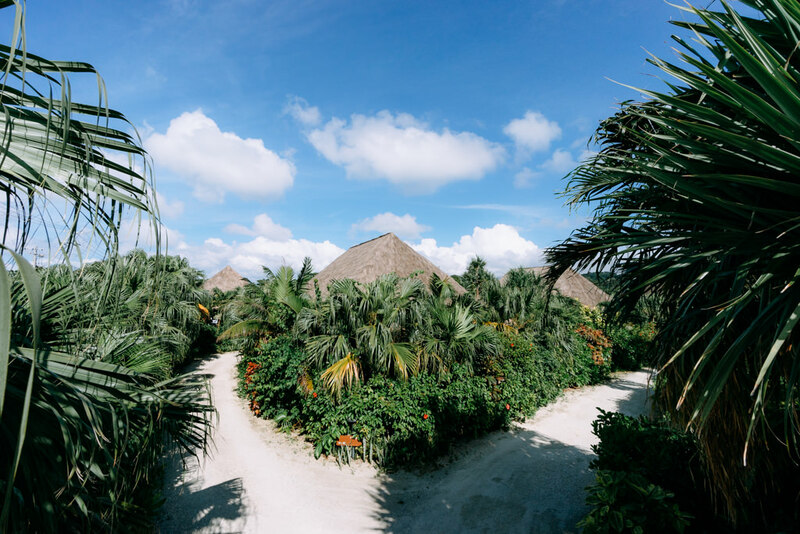 There are self-contained 2nd floor apartments and stand-alone Okinawan-style cottages. It’s modern, clean, and the service is outstanding. A simple, clean and homely guesthouse (shared bathroom) located on the north west side of Ishigaki. Umisuzume offers breakfast and dinner packages using local ingredients. 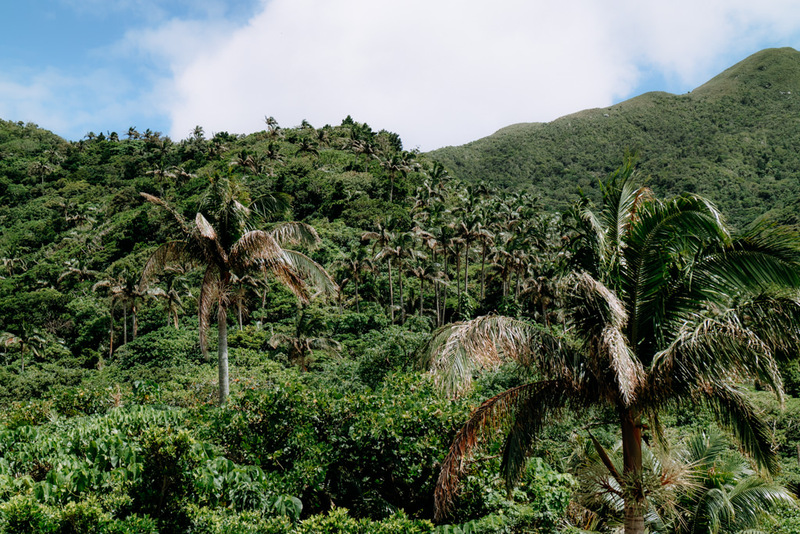 Located at the same latitude as The Bahamas, Ishigaki Island has a Tropical Rainforest climate as opposed to Humid Subtropical climate of Okinawa Main Island and the other northern islands of Okinawa Prefecture. The average yearly high temperature is 26.9°C (80.4°F), and the average yearly low temperature is 22.2°C (71.9°F), making the mean annual temperature of 24.5°C (76°F) which is the same as Oahu of the Hawaiian Islands. The climate is similar to Southern Taiwan, warmer than Hong Kong and Northern Taiwan due to the warm ocean current around Ishigaki. 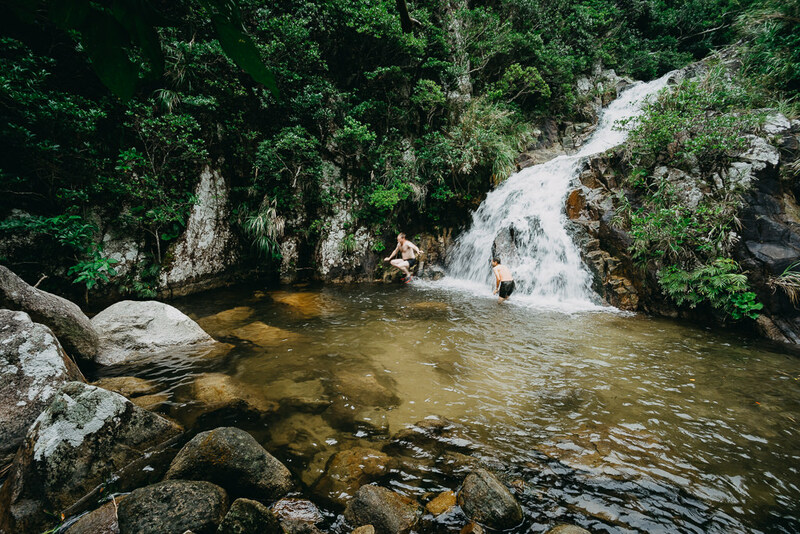 The annual average humidity exceeds 75%, which makes the feeling temperature very different from dry places with the same mean annual temperature such as Townsville in Queensland, Australia. The sea temperature is warm all around the year, ranging between 21°C (70°F) and 31°C (88°F). The rainy season is May-June but it does not rain all day. Usually it’s just a few downpours in-between blue sky. The core season for typhoons/tropical storms is August-September but some years have very few typhoons/tropical storms while other years have many typhoons/tropical storms even as early as May or as late as November. However, at least one typhoon/tropical storm hits Ishigaki during August or September every year. Usually a typhoon/tropical storm affects the weather only for a few days and you get beautiful clear blue sky as soon as the typhoon passes away.